I know it's been quite a while since our last post but all that's about to change. We have a lot of things to discuss now including the fabrication of the main steel stair and railings (which is underway) along with the roof deck rails. We have some plumbing changes to talk about, some HVAC dilemmas, the ongoing kitchen design , some updates on finishing out the building envelope, a 'green' home tour, and many other things. So we are considering switching this blog over to Wordpress (which I will discuss later on) and I was going through some older post "edits" and saw this little gem that I had almost forgotten about. It was never published. It doesn't go into an incredible amount of detail but it should give you a sense of what we were doing 'way back when'. The post describes how we found the property, what we originally designed, and some of the process we went though early on. Click HERE to view this previously unreleased post. I was looking into what kind of sustainable options we might have for drywall and I found some interesting products. One option is a "paperless" drywall product by Georgia-Pacific called DensArmor Plus® Paperless Fiberglass Mat. It is a highly mold-and mildew- resistant interior gypsum panel. "DensArmor Plus panels feature fiberglass mats on both the front and the back for the best in interior protection from moisture currently available. The moisture-resistant fiberglass mats [also] make DensArmor Plus panels the ideal replacement for paper faced greenboard, where greenboard is still allowed by code." One drawback I saw in using the DensArmor was the fact that it contains fiberglass and you would need to be careful when handling it. But the contractor indicated that this wouldn't really be a problem and shouldn't be a deciding factor. The only remaining drawback I found then, was cost. Based on what I found, a typical 4'x8' sheet of DensArmor drywall costs about 60% more than a standard drywall sheet. That's a pretty significant cost increase so we will have to see if we have that kind of room in the budget. The way things are going though...I don't know. Another option I found was a very new product called Eco Rock by Serious Materials. Actually, this product is not even out yet (scheduled for release in late 2008). There are two major differences I see between Eco Rock and other drywall. First, it uses a large amount of post-industrial recycled content. And Second, it uses a lot less energy to produce. "Over 30 billion square feet of drywall are produced each year in the U.S. and Canada. A single sheet uses between 100,000 and 400,000 BTUs of energy to produce, depending on the age of the plant, producing 16 pounds of greenhouse gases per sheet. Approximately one-quarter of the cost of a gypsum drywall panel is tied to energy, with likely long-term cost increases; carbon taxes are common in Europe and may come to the U.S.
By contrast, EcoRock uses 80% less energy in the manufacturing of its core. No heaters or dryers are used in production, nor calcining processes – resulting in 80% less CO2. EcoRock also uses 85% post-industrial recycled content and is fully recyclable. A plant built for EcoRock reduces energy use to a minimum." You might have heard of Serious Materials as they are the makers of Quiet Rock (a 'soundproof' drywall product). FYI...one sheet of Quiet Rock is acoustically equivalent to eight sheets of regular drywall. That's pretty amazing. The Eco Rock product looks very promising but what I find even more compelling is the business philosophy held by Serious Materials' CEO, Kevin Surace. The following is a link to an article about him and his company (from about a year ago): Cleantech Article. Read it when you have a few minutes. I just wish there were a few more industry leaders like this around. 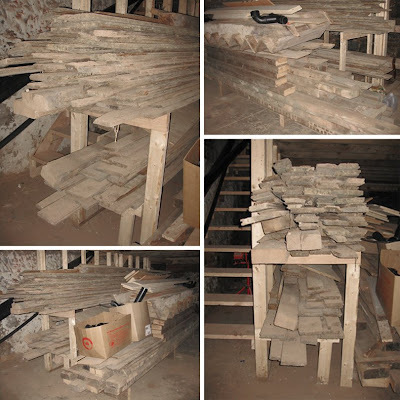 Here are some images showing all of our salvaged lumber from the original house. It's being stored in the basement. On the taller stack, is the original pine flooring. This is all that was left after discarding what was rotten or severely damaged. The lower stack is all the salvaged 3x timbers. 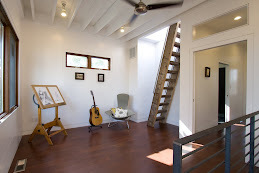 You can also see the old basement stair (which we have not figured out what to do with yet). All the lumber has been cleaned and de-nailed but still needs some work. As far as the pine flooring goes - although we are planning on using the carbonized strand bamboo for most of the floors in the house - we were thinking that it would be nice to lay the reclaimed pine floors up on the third floor (Master Suite) and limit the bamboo to the first two floors. If we determine that we don't have enough for the entire floor (which I fear we don't), we might just use it in either the Den or the Bedroom and have bamboo in the other. Then we could possibly use cork, in the connecting hallway, as a transition with tile being in the bathroom. All these materials are great but we need to be careful not to have too many flooring types in one area. **An important note about re-laying hardwood floors: we have found that it's best not to plane the boards down (as tempting as it may be) before you re-lay them. The reason for this is that these boards are "tongue & groove" and once you start the planing process, you inevitable lose the centralized location of the T&G running along the side of the plank...and then you have real problems as the boards don't fit back together. This is because you will most likely plane more off of one side than the other. Your best bet is to simply re-lay the floors down in the state they are in on top of the new joists or sub-floor and then use a drum or orbital sander to take them down for refinishing. This is not the 'end-all-be-all' solution but it seems to be one with better odds for success. Here's a shot of some plumbing progress (to show that it is actually happening!). On the left is the Kohler tub being installed in the second floor bathroom. The image on the right shows the ABS vent pipes heading up to the roof. The PEX is going in today and we should have running water by next week. Electrical and HVAC are also mobilizing now. Here's the roof deck. As you can see, it will take a little while for the vegetation to "integrate" with the deck. We are really happy with the way the deck came out and feel the end result will be truly unique. We should be getting the cable rail system in the next week or so. We still have our temporary roof hatch (a piece of plywood). The actual roof hatch will be arriving in a couple of weeks. The product we finally decided on is a custom sized, powder coated aluminum exterior and Birch wood interior hatch with a low-profile, double pane (insulated) clear acrylic panel and gas shock lifts. 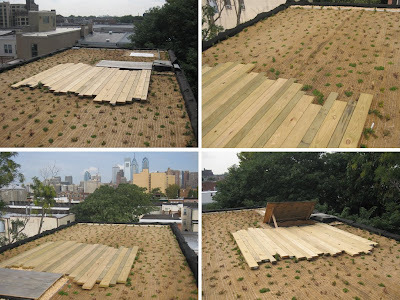 It is manufactured by a company called Insuladome (based in Long Island, NY) and ordered through Specialty Building Products (just outside of Philly). It's a great looking product that is well-built and priced very competitively (even for a custom size).